The positives of mobile phone use in the developing world are abundant. We have seen a rise in the use of mobile phones in various sectors from health to education to agriculture and economics. The following series of blogs will look at programs utilizing mobile phones as a method of distributing knowledge and/or services. Why mobile phones? The answer lies in accessibility and low cost. For many access to a computer is limited and few homes have landlines. This is in large part because the infrastructure needed to establish a reliable connection remains deficient. The expense of a basic cell phone remains low and when the cost is too high for some it is not uncommon for groups to share the phone. Because of this relative ease of access, development agencies have many uses for mobile phones which will allow a greater population to obtain the services provided. This is an amazing feat, and World Bank credits it to the increased use of mobile banking in the developing world. World bank data shows that countries with developing economies, ownership increased from 41 percent of the population in 2011 to 54 percent of the population in 2014 (see graph below). Though we see great strides being made in overall population procurement of bank accounts, this graph also shows that there is a gap in account acquisition when gender becomes an indicator. 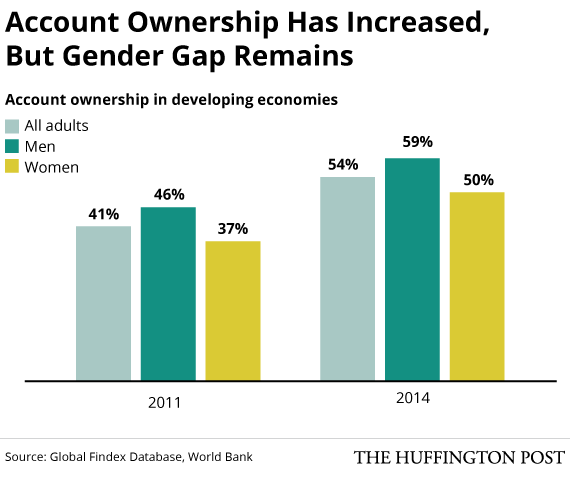 “The 2014 Global Findex report found that the financial inclusion gender gap has not narrowed: an average difference of 7 percentage points globally in financial account ownership between men and women has persisted from 2011 to 2014. In developing economies, the gender gap has remained at an average 9 percentage points, and in some countries that gap is much higher.” Teach By Tech, Inc recognizes this disparity and is focused on financial literacy for women specifically as we recognize the access to financial institutions and services can reduce poverty and improve productivity. One of the most successful models of mobile banking is M-Pesa in Kenya. M-Pesa (Swahili for money) launched in 2007 by Vodafone for Safaricom and Vodacom. It is a mobile phone-based money transfer, financing and microfinancing service. M-Pesa allows subscribers to use a pin-secured virtual bank account on their mobile phones. The telecom recognized that location was a primary obstacle to banking access. To overcome this Vodafone took the banking industry to the people. As the world continues to meet obstacles to equality, safety, access, protections and human rights, it is imperative that humanitarian agencies and corporations work together to overcome obstacles and bring new solutions to the world’s most pressing problems. In Bangladesh, bKash Limited, a subsidiary of BRAC Bank, is focused on increased financial inclusion. Their service allows the people of Bangladesh to safely send and receive money via mobile devices. This program eliminates the complications of location in accessing financial services. According to the bKash company profile, less than 15% of Bangladeshis are connected to the formal banking system whereas over 68% have mobile phones. This is another example of expanding availability to financial services via mobile phones. Corporations and development agencies have found the success in partnerships to enhance or expand services. Both the World Bank and Bill & Melinda Gates Foundation are partnered with bKash. Mobile phones are becoming more prevalent throughout the world. Mobile phones can provide the opportunity to increase human capital and provide services to more remote locations. Opportunities for the developing world are plentiful, if applied appropriately with the needs of local people in mind as the driving force of adaption and implementation. Mobile phones can be transformative for the global community. Check out our next blog. We will look at the relationship between mobile phones and the health services. The Economist. “The Poor are Different” http://www.economist.com/blogs/feastandfamine/2012/04/banking-developing-world, 2012. World Bank Group. “Global Findex Database, 2014: Measuring Financial Inclusion Around the World” Policy Research Working Paper 7255, 2015. P, vi. Center for Technology Innovation at Brookings. “THE 2015 BROOKINGS FINANCIAL AND DIGITAL INCLUSION PROJECT REPORT Measuring Progress on Financial Access and Usage.” https://www.brookings.edu/wp-content/uploads/2016/06/fdip2015.pdf , 2015. The New York Times. “Kenya’s Banking Revolution Lights a Fire” https://www.nytimes.com/2014/01/21/opinion/kenyas-banking-revolution-lights-a-fire.html?_r=0, 2014.